A silent presence, raptors grace the sides of highways and byways and farmland of Northern California. Among them are Swainson’s hawks, golden eagles, burrowing owls, American kestrels, red-tailed hawks, white-tailed kites, barn owls, great-horned owls, peregrine falcons, prairie falcons, and the occasional American bald eagle. It’s not uncommon to see a Swainson’s hawk perching in the upper reaches of a eucalyptus tree or a red-tailed hawk surveying the world from the broad branches of an old oak. These birds of prey frequently nest in the oak, cottonwood, and eucalyptus trees in this area. Nestled beside farm fields at the edge of Davis, the California Raptor Center (CRC) receives injured hawks, eagles, American kestrels, and owls. At the CRC, a program of the UC Davis School of Veterinary Medicine, these birds of prey known for their keen eyesight and sharp talons are given a second chance. 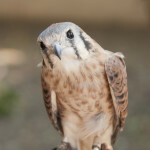 The center is an educational and research facility dedicated to the rehabilitation of injured and orphaned birds of prey. A collection of old buildings and spacious cages serves as a trauma center and rehabilitation facility for the area’s injured raptors. Each year as many as six to ten veterinarians from the veterinary hospital treat the injured and rescued raptors that are brought to the CRC. Operations Manager Bret Stedman has worked at the CRC for 33 years. He started as a center volunteer when he was a UC Davis undergraduate and eventually his work turned into a career. These days, an average of 55 volunteers assist at the CRC. Collectively, these dedicated individuals annually donate an estimated 11,500 hours in tender loving care to raptors and the CRC. The CRC becomes a new home for raptors whose injuries mean they will never thrive in the wild. For instance, some might have wings that won’t be strong enough or eyesight too poor for hunting. Among the raptors deemed non-releasable, many become teaching birds, ambassadors for their species, as part of the center’s educational outreach program. These birds participate in presentations on and off the site. Each year the CRC reaches about 5,000 persons through tours and outreach programs in school and with other community groups. The first hope for each injured bird brought to the center is that it will be restored to full health and be released back into the wild. According to Stedman, 55 to 60 percent of the raptors brought to the center are treated and released. Stedman says that’s a relatively high percentage for a rehabilitation center. In the process of training a raptor to the glove for educational purposes, the bird is fitted with anklets and jesses, to which a leash is attached. This offers some control over the bird’s actions while an experienced handler teaches the bird to accept the company of a human partner. Through daily sessions over a long period of time, eventually these birds learn to remain calm in front of a crowd and some are further trained to accept traveling in a crate for presentations at schools and other community groups. The center’s teaching raptors are trained to work with several handlers. Among the hawks at the center are Grasshopper the Swainson’s hawk, Rosa the Harris’s hawk; and Angel and Diego, both red-tailed hawks. More red-tailed hawks live in and around urban areas these days, apparently attracted by the rodents that follow human activities. They’ve been photographed catching pigeons in cities. 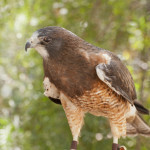 In different parts of the country, one will see different variations of coloring among red-tailed hawks. Red feathers on a hawks legs, belly, and chest means the bird is termed a “rufous” red-tail, which are common here in Northern California. Swainson’s hawks, named after British naturalist William Swainson, have made a comeback from 400 California nesting sites in 1979 to more than 2200 today. This was largely accomplished after harmful pesticides were banned in Argentina, and also because of habitat protection, according to Bret Stedman, Operations Manager at the California Raptor Center. GPS tracking systems placed on some birds provide a signal that goes into space and directly informs scientists of their locations. In the past, banded birds had to be sighted by observers and the tracking was much less accurate. The latest tracking systems have revealed differences in the migration patterns of the Swainson hawks that live in California, compared with their counterparts to the east. Data now shows that Great Basin Swainson’s hawks go all the way to Argentina whereas Swainson’s hawks that live in California typically migrate to and from Mexico and Central American destinations. Annually, each spring and fall, the center opens to the public for its seasonal Open House. The date for this year’s fall Open House will be October 17th. On this special day, visitors are treated to viewing the teaching of birds “on the glove” and display birds perched in their cages. Grasshopper arrived at the center in 2006 and was found to have cataracts that could not be completely removed. He’ll never see well enough to hunt. Swainson’s hawks typically feast on insects nine months of the year and enjoy eating grasshoppers and locusts, thus Grasshopper was so named. He’s known for remaining extremely calm with his trainer and so he also participates in off-site presentations. 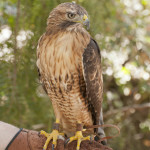 Diego is a red-tailed hawk with a poorly healed shoulder fracture. He worked well with two trainers and then became willing to work with several trainers He can be feisty and prefers staying in his cage to meet his public. Angel is a female red-tailed hawk who lives at the CRC. She was treated and released, but subsequently failed to thrive in the wild. She flew well enough, but tended to crash into the ground at full speed. UC Davis veterinarians found that her eyesight was fine and diagnosed her for a brain lesion that affects her landing ability. Since there was no way to correct her condition, she was non-releasable. With Angel, the taming process didn’t work. In fact, she became more agitated and aggressive rather than calmer. Thus, she now serves as an ambassador while remaining in her cage, and yet on display for visitors to enjoy. 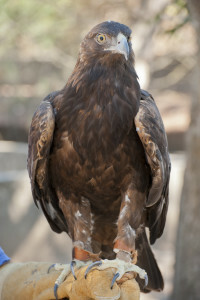 Sullivan, known as “Sully,” is one of the golden eagles at the California Raptor Center. He arrived after he was found in Monterey County. His badly injured left wing required amputation of the wing tip, meaning he couldn’t be returned to the wild. Sullivan is one of the center’s teaching birds that works in public presentations. Fuzzy is a golden eagle that was found on Altamont Pass, California, near the area’s electricity-generating windmills. She suffered a fractured left wing, apparently from flying into the huge structures and crashing to the ground. She got her name because she is so relaxed and calm around people. She was ruled non-releasable in 1996 after two surgeries and months of therapy. Two handsome falcons that share the same cage at the CRC offer visitors the chance to observe the differences in these two species. 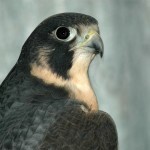 Horus is a Prairie Falcon who arrived with a broken wing in 2005. Even after a long period of rehabilitation he couldn’t fully extend the wing so his ability to fly was limited. He is neither strong enough nor agile enough to hunt. He can’t survive on his own in the wild and so he can’t be released. 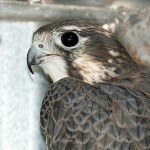 His cage mate is Cowboy, a peregrine falcon who was found near Santa Cruz in 2007 with wing and leg injuries. He also had “bumblefoot,” an infection on the pads of his feet that was treated at the UC Davis Veterinary Teaching Hospital. In the wild, peregrines swoop down on unsuspecting prey—mice, squirrels and other animals, with high-speed dives of over 250 miles per hour. Even with the best veterinary care, Cowboy will never again have the strength and speed needed for catching prey in the wild. He, too, is non-releasable. 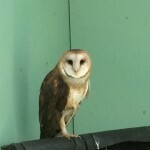 Citrine is a barn owl that lives at the California Raptor Center. Barn owls like to nest in the cavities at the tops of palm trees. Unfortunately, the choice can often end badly when windstorms send the owls to the ground, making them one of the raptors most frequently rescued and brought to the CRC. Next to the barn owl, the second most frequently treated raptor is the red-tailed hawk, and the third is among the smallest of raptors, the American kestrel. This article first appeared in the June/July 2015 issue of Local Happenings Magazine. Kristine Mietzner is a Northern California writer.